The annual Bend Area C.A.R.E. 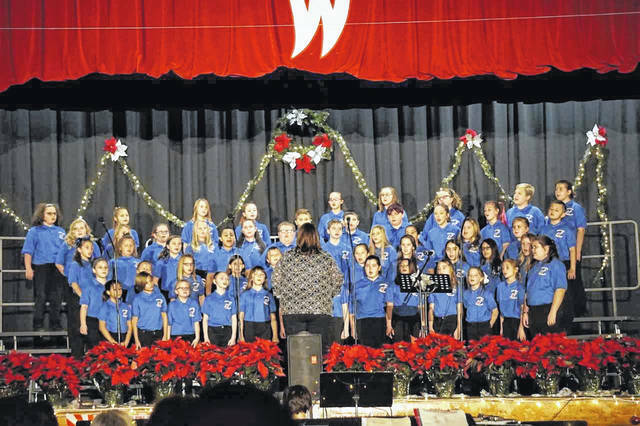 Christmas Concert, featuring entertainment from students at both Wahama High School and New Haven Elementary School, will be held Sunday, 2 p.m., at the Wahama gymnasium. Proceeds from admission go to the C.A.R.E. organization’s “Kids for Christmas” program. Pictured is the New Haven Elementary School Choir, under the direction of Kimberly Bond, during last year’s concert. MASON — The largest holiday concert in the Bend Area will return Sunday, and will once again benefit those in need. The annual Bend Area C.A.R.E. Christmas Concert will take place at 2 p.m. in the Wahama High School gymnasium. It will feature the talents of the students from both Wahama and New Haven Elementary School (NHES). Admission is $3 per person or $5 per family. Admission proceeds will go to the C.A.R.E. organization for its “Kids for Christmas” program. In addition, there will be a 50/50 drawing and poinsettia (from Bob’s Market) sales, which will benefit the Wahama choir. The concert will feature music by the high school band and choir, as well as the NHES band and choir. A number of individual piano students will also be featured. The NHES choir is under the direction of Kimberly Bond, and is made up of students in fourth through sixth grades. The choir will be singing “I Feel Like Fa La La La,” “Glow,” “Blanco Es El Invierno,” and “Deck the Halls.” “Glow” will feature the choir’s three all-state members, Kate Reynolds, Johnathon Roush, and Anna Bella Mankin. A mass choir number will be presented by both the elementary and high school members about unity, according to Rachel Reynolds, Wahama choir director. The song title, “Sisi Ni Moja,” means “we are one,” according to Bond, who will be conducting the number. It will also feature Reynolds on piano, and Wahama Principal Kenny Bond on the djembe. According to C.A.R.E. member Leonard Koenig, the concert usually raises approximately $1,000. The money is used to provide food vouchers from Powell’s in Pomeroy for the families served by the “Kids for Christmas” program. Koenig added about 20 families, with a combined 60 children, are being served by the program this year. Members recently put between $13,000 and $14,000 back into the local economy by buying gifts for those children at Walmart in Mason.